The CM-24 is a true modular system. Each CM system module is a perfect match ready to bolt to the next unit. Each end of every CM unit has a thick mating plate, laser cut for precision. The CM system mating plates allow you to choose the number of stages, and add or remove a module at any time. 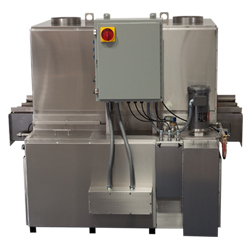 All CM-24 Wash/Rinse Modules are built with the same specifications, H.P., heating, controls, and size. 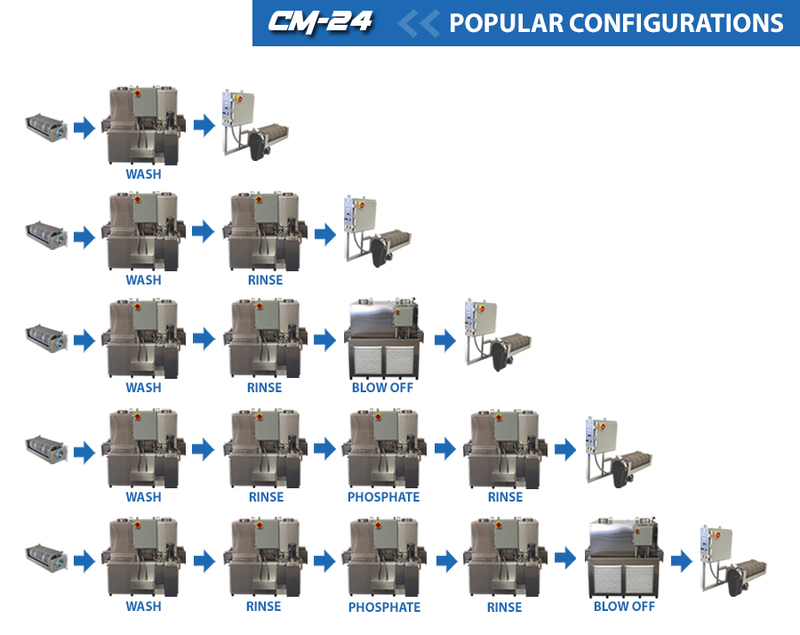 Each CM-24 module can be designated for use as a Wash, Rinse, Phosphate, or Inhibitor. All CM-24 modules are pre fitted and prewired to except accessories at anytime. We call it Plug & Play. This is where the magic starts, great performance at any cleaning height between 2” and 15”! The top spray manifold is easily adjusted up or down from the outside of the CM-24 and the CMB-24 blow off. The belt width is 24” giving this system a wide working platform. There is no lack of pressure with our 5-H.P. stainless steel vertical seal-less pump. The lower spray manifold has an easily accessible flow control valve, this allows you to regulate pressure from the bottom spray for those lighter parts. You have complete control of the spray action. 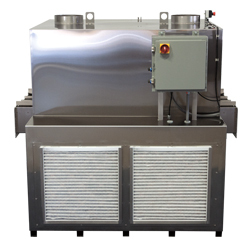 Our standard CM-24 has all the features and upgrades that most of our competitors offer as an option. Construction is 99.9% Stainless Steel, interior and exterior, plumbing, pump, shafts, and sprockets. 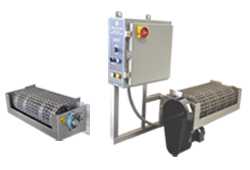 Heavy duty C1 flat wire stainless steel conveyor belt. Low water heater cut off control. Auto Fill/Level control. Insulated slanted floor bottom with sump cleanout area. Insulated reservoir and tunnels. Control panel power disconnect with lock out. All four heaters have separate controls. Heat time clock. All function controls are 24 volt. Emergency stop on both ends. Color coded wiring. The stainless steel construction of the CM modules insures longevity and will retain their value for many years. Heavy duty industrial controls are used on CM systems. All TIG welded construction. Changing and cleaning out the reservoir is quick and efficient with our slanted floor design and large 2” drain port. Nozzles are stainless steel with quarter turn removable tips. Tunnel is easily removed by lifting straight up via lift rings mounted on top. All pumps and components are easily accessed.